I got lots of great advice from you guys about what to do about it. Most of you suggested that all we needed to do was install quarter-round along the baseboards to cover it up. We got some trim that was a little smaller size than that for $20 bucks, and it only took a couple of hours for us to put it down. It turned out to be an easy and effective fix. Hooray! When I stepped back and saw the difference it made, I heard angels singing. Ahhhh! We touched up the baseboard paint while we were at it, which had gotten kind of beat up by all the grout-slinging, and went around the door frames (where there couldn’t be trim) with white silicone. And, as you can see, we had old carpet in the vanity area and vinyl in the water closet. It wasn’t pretty. We tried to get that giant plate-glass mirror off the wall, but it wasn’t budging. So we did the next-best thing and framed it with moldings. But it wasn’t easy. When it came time to hang the top piece, we were stumped because there would be nothing to hold it up there overnight. Then Dave had the idea to wedge a ladder into it–and it worked! I just hung window treatments I found on sale at Pottery Barn (Elena Palampore Linen Sheer Drapes–don’t you love the fancy names they give them?). From the bathroom you can see the heavier lined Alessandra drapes in our master bedroom, so they had to kind of coordinate. In case you missed my earlier post about it, the tile I chose was a design that reminded me of something you’d find in an old house like the one I grew up in. It’s called Sausalito. Our laundry closet is directly to the right behind double doors. There was supposed to be a giant tub there, but I knew I’d rather have my washer and dryer in my bathroom so I would never have to haul baskets of clothes downstairs and through the kitchen. I’m lazy like that. We put a tub in the water closet instead. That freed up the laundry room off the garage to be a dedicated mudroom, which I honestly don’t know what I’d do without. In this next photo you can see how the bathroom is open to the bedroom. I don’t know who started that trend, but this is the second house we’ve lived in that had this set-up and I HATE it. We added the double doors between the bedroom and bathroom, at least. Otherwise it would have been completely open. 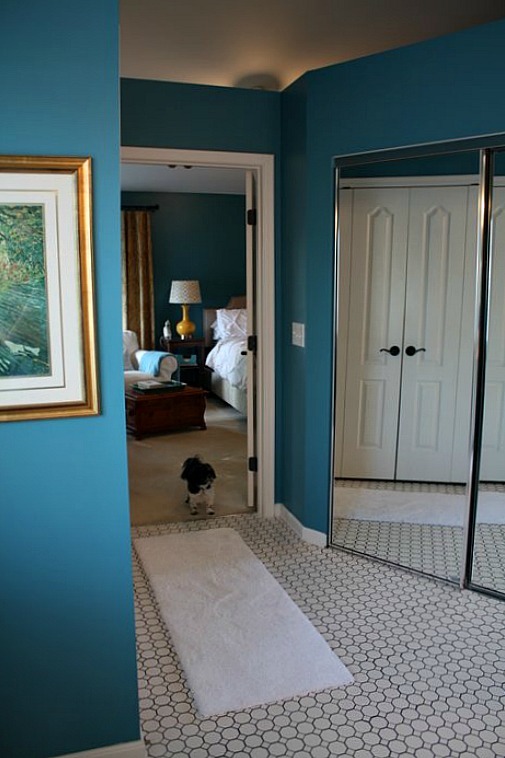 Those mirrored doors lead to our walk-in closet, and the laundry is on the left. It’s a pretty efficient set-up. I pull clothes right out of the dryer and hang them up in the closet. 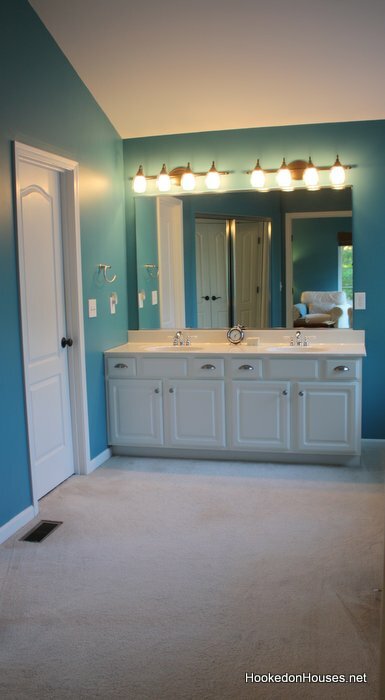 So there you have it–my pretty-much-finished master bathroom. I’m still tinkering with some of it. Since I took these photos I hung some hammered-brass sconces and a few other things. I feel like our master bedroom and bath makeover took up most of my decorating energy (and budget) for 2012. Now I’m trying to decide what to focus on in 2013. Lots of rooms need new flooring, including our bedroom. I think our finished basement will get some attention, and I’m itching to redecorate my family room. Do you have any “house goals” for the new year? The tile! The blue! I love it! Wow! I love it, Julia. It’s fresh, elegant and timeless in so many ways. Looks Great Julia! Love the bench with curtains. Gives the room a soft touch. See! All is well that ends well! What an improvement the little trim makes to the grout! Congratulations, it looks marvelous! I went through something kinda similar when I picked out my granite for the retirement house we recently built. We were long distance and a lovely neighbor would periodically send picture updates. When she sent one of the kitchen granite my heart sank. I HATED it!!! I moaned and groaned and then just decided what is done is done. Then when I actually saw it in person, I loved it!! My husband thinks I’m a wee bit crazy! Oh my gosh, so amazing! I’m with you…the quarter-round makes all the difference in the world. You must be thrilled! Your bathroom is so pretty. I like the black grout, and that quarter round made a huge difference. I know you must be enjoying your new bath. Excellent job Julia — a wonderful transformation! I love that wrote about how you moved the laundry room up to make way for a mud room. And adding doors was certainly an excellent idea. 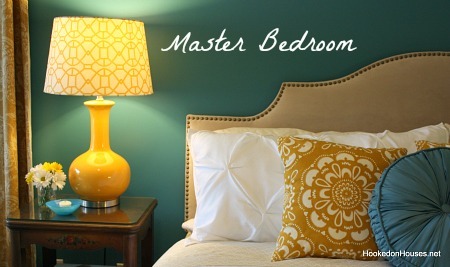 Congratulations on master bedroom/bath perfection in 2012! WOW!!!! can I come over and take a shower. Now I have to go up to my vanilla bathroom and try to be inspired! I’m so glad for you, Julia! That bit of toe molding surely made a difference, didn’t it? Your black and white floors look smashing now, and everything in your bathroom coordinates beautifully with your bedroom. I’m so glad you went for a bolder look–it’s lovely but still serene. Well done! Gorgeous! Love the color especially 🙂 Congrats! Your bathroom is so big! I love the window and bench area with your new curtains. 🙂 Great job on the whole redo! Very nice! 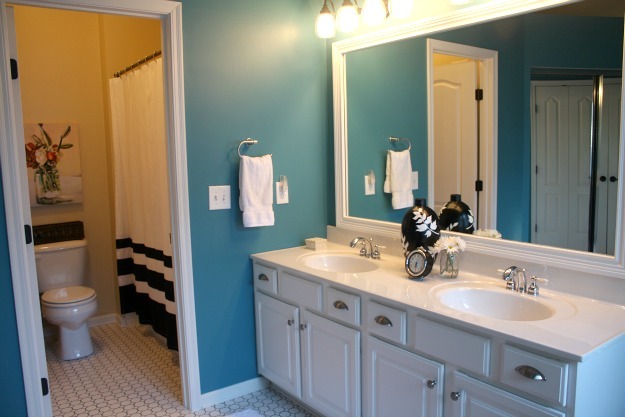 I love the colors, and the trim on the mirror and baseboards made all the difference. We recently had a screen porch added to the back of the house, which I love. Still want to add a bathroom downstairs (we only have one upstairs), and fix up one bedroom to be an office and art studio. We refinanced so we have the money, just have to get it all done! I absolutely love decorating new spaces, especially with things we’ve collected over time and flea market and auction finds. I just have to add one thing. That little spot to the right of the black bench is just screaming out for a tall plant in a lovely pot. And with the humidity from your bath, and the window, I bet it would be death proof. That is if you are a plant killer like me. ha. It looks wonderful, Julia. Adding that tiny trim along the tile floor made all the diffference in the world. Wow! I can’t believe the trim made that big of a difference on the floor but it really did, I didn’t think it looked horrible w/the black line but then when I saw the trim installed holy cow looks so much nicer! The whole room looks fantastic, the trim on the mirror made a huge difference and the bench in black looks awesome! Oh, wow, Julia! It looks fantastic! Congrats! I just love the colors of teal and gold together and once the bench was painted black it defined itself with the tile grout. It is a great Happy space. Great solution!!! 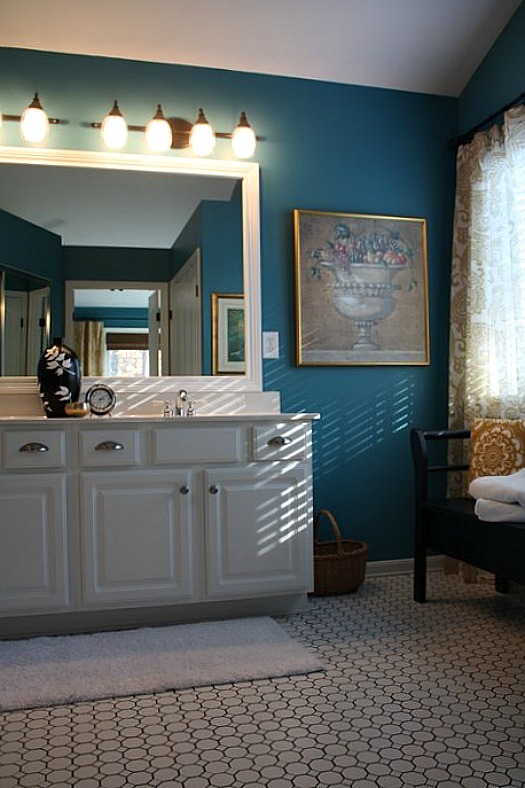 I love your bathroom AND your bedroom, such a fresh color medley, bravo my friend! It turned out really nice……. I love the frame around the mirror, made all the difference in the world. I agree, Wondering Woman. The framed mirror totally changed the look and feel of the room. Having one of those “naked,” giant mirrors myself, I was thrilled (and inspired) to see what it *could* be! Turned out beautiful! We are embarking on our (only) bathroom renovation this spring. You are so lucky to have all that space to work with. My bathroom measures just barely 6′ by 6 1/2′! The good thing is it keeps cost low when installing flooring, paint and trim!! Julia, Wow!!! I love it! 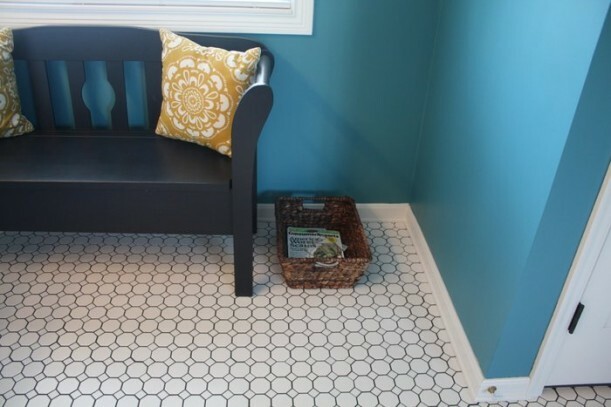 The tile, the blue, the bench…it’s all wonderful! It is just beautiful! 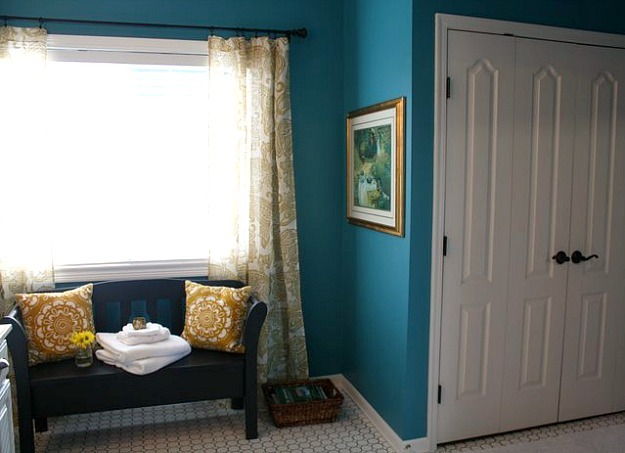 Thanks for sharing how the bedroom transitions into the bathroom. With the carpet in front of the vanities, I was confused at first. Great job! Yeah, all the houses in our neighborhood were built with these open bathrooms and the builder carried the carpet in from the bedrooms. It’s one of those things I’ve hated since we moved in but it took me 8 years to get around to changing! I’m with you on the open bathrooms. We’re renting a house right now due to relocating recently and the bedroom wall connecting the master bath has a gap at the top, carpeting all the way through (hate that!) and no door whatsoever leading into the bathroom (just an opening). I put up a tension rod and hung a curtain for a little privacy when I’m showering. The master closet is the same – the walls stop about 18″ from the ceiling so it’s all “connected”. I’m thankful for this home and I’m all for a Master suite, but would never buy a home like this. Oh and I second the plant idea by bench and window! Beautiful, Julia! I never would have thought to paint he bench black, but what a difference! Great update on the cheap. I agree on the washer/dryer, smart move. My house has them upstairs too and I would never, ever change that. It’s shamelessly my favorite feature of the house. Really comes in handy when the kids are sick, too…ha! Wow! I feel for you. Not only is redwood dark, but it is dated. I am trying to undestand what makes it so valuable. Is it rare? Does it make the house itself more valuable? Does it go with the architecure or with the outside landscaping? If you removed it, could you sell the paneling for a good price? If it were MY home, I would either paint it or have it removed. My parents had a home with redwood siding which they painted and repainted yellow about every 4 years. It is my impression that redwood doesn’t hold onto paint very well (at least on the outside of a house). No one should have to live with an architectural feature or with ANYTHING that they don’t like just because it is “valuable”. If your hubby really loves, the redwood, have it taken down and installed in his “mancave”. You should not have to live with it..
Julia, it’s just perfect! I love the blue, love the bench, and the floor turned out gorgeous. Well done! 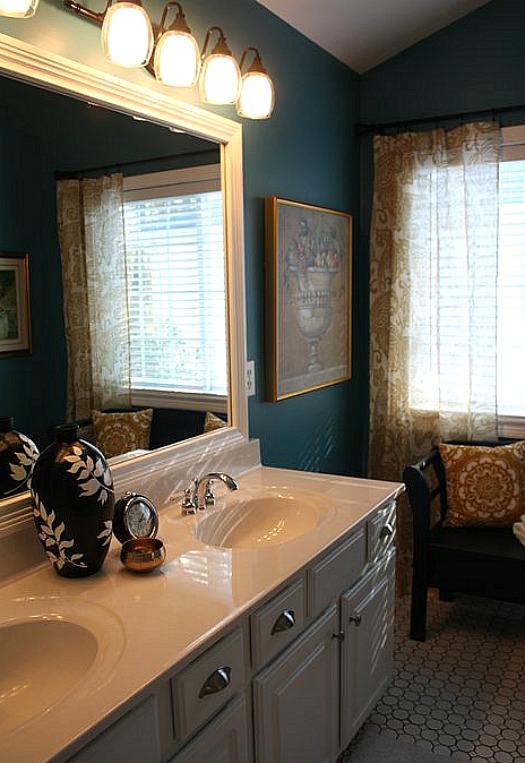 Love the tile, and don’t those two frames on the mirror and window make all the difference? Happy new year, Julia! I love it all, but have to say this: what a perfect blue!!! Wow your bathroom looks great. I love the idea of framing those giant builders mirrors with wood. When I saw your pictures I immediately showed my husband who was sitting beside me. ” Honey we need to do this”! I love the framing for the windows but I think our curtains would hide it. I’ve never had a mudroom so I wouldn’t know what to do with one. I’m not sure if that is more for up north where people need to unload their heavy coats and boots from the snow. Down south here it’s not that cold often. My mudroom is currently piled full of snowboots and winter coats so I do think it probably makes a difference where you live. I really don’t know what I’d do without mine. We didn’t have a mudroom at our last house, and the door from the garage came directly into the kitchen. My kitchen became the mudroom because few people would walk all the way across the house to put their stuff in the front closet. Drove me crazy, which was why I was determined to have one here! Love it! Great color scheme! BRILLIANT! ! ! Love Love Love!!!! Your bathroom came out beautifully! 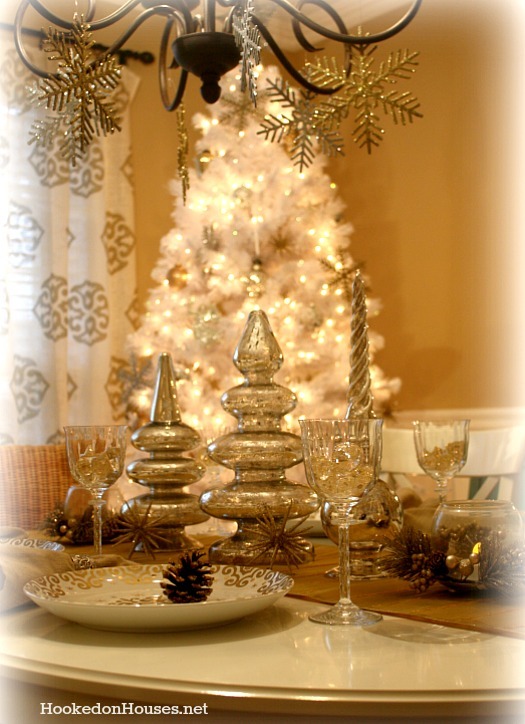 Just a hint – I do those molding/frames for clients often when the builder has glued those huge glass mirrors to the wall – as simple as picking out pretty chairrail moldings at Home Depot! However, forget the glue!- they just go on with 1/2″ double-sided sticky tape from Scotch/3M (one strip on the inner edge, and one on the outer edge of the flat back of the molding frame you make). It’s strong enough to hold up the light-weight frame you’ve made, and no mess! Takes a very short time too! That’s brilliant! Wish I’d thought of trying that. I’ll remember it for next time, though! 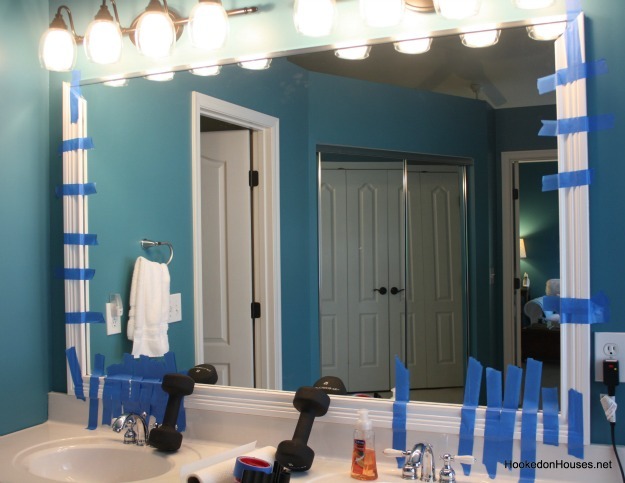 I’ve heard of using velcro to adhere molding to a mirror, too. Looks easy enough for even me to do. I’m glad to see another master bath without a bathtub! I recently remodeled our master bath and removed a giant (dust catcher) tub to make room for a walk-in closet. I just hope whenever we decide to sell that it won’t be a problem. 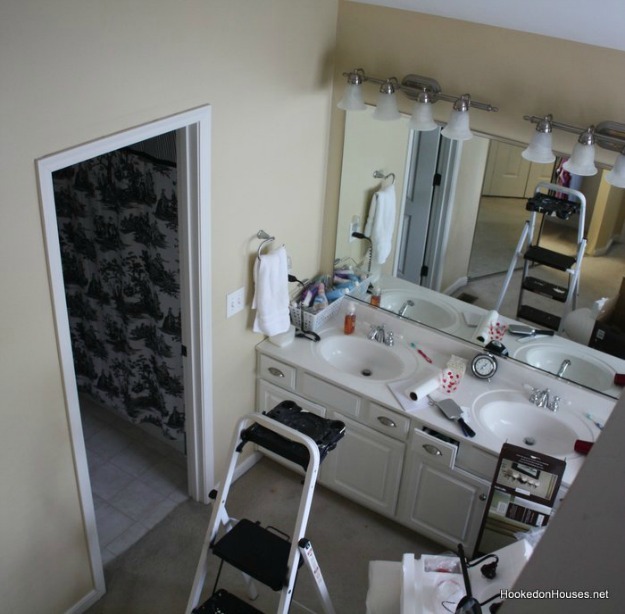 Is the wall between your bedroom and bathroom only partial height? That’s what it looks like in the pictures. If so, that wouldn’t be hard to fix, although now that you’re finished painting, you probably don’t want to start another project! Yes, that wall is only 8′ tall–it doesn’t go up to the peak in the vaulted ceiling. We have talked about taking it all the way up but never acted on it. Maybe someday! It looks beautiful! You did a fantastic job! Really love that tile and the trim to hide the black edges looks terrific. (You already know how much I love black and white!) The blue is fabulous and I love how everything pops against it. I was studying the space that holds the pretty bench and thought it LOOKS as if a freestanding tub would fit the space beautifully if you ever wanted one down the road OR to tell prospective buyers some day. They come in all sizes, with and without feet these days. Hopefully it wouldn’t be too complicated or expensive to do with all the water and drainage pipes you already have in the space. 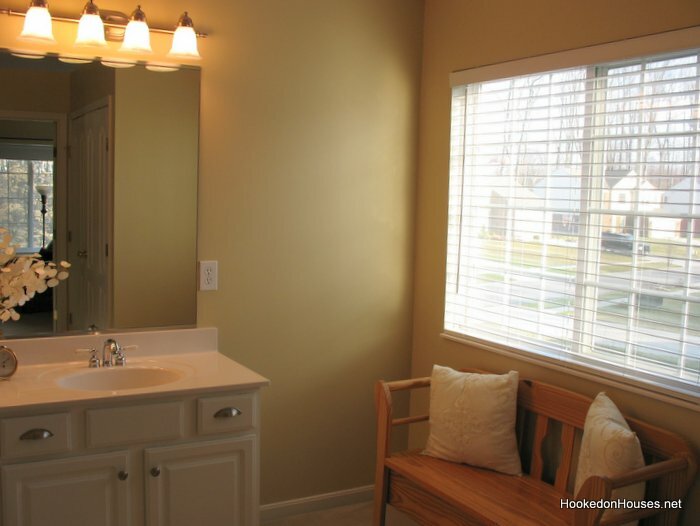 I wouldn’t want to lose that washer and dryer either….and I really love a place to sit in a bathroom. You are so lucky to have such a nice space to add that cute bench! Well done! 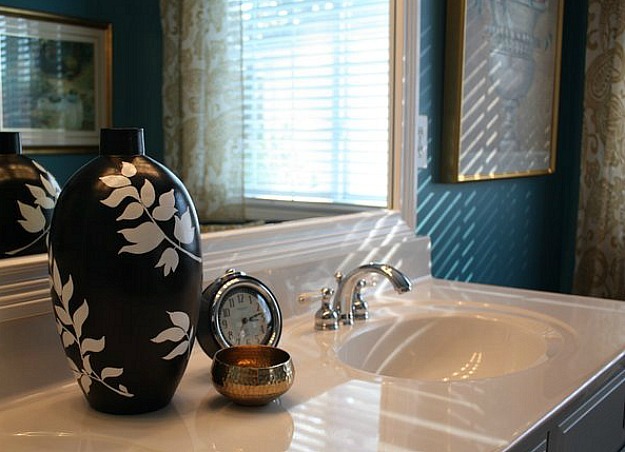 Beautiful work on the bathroom, it never ceases to amaze me what a can of paint can do. 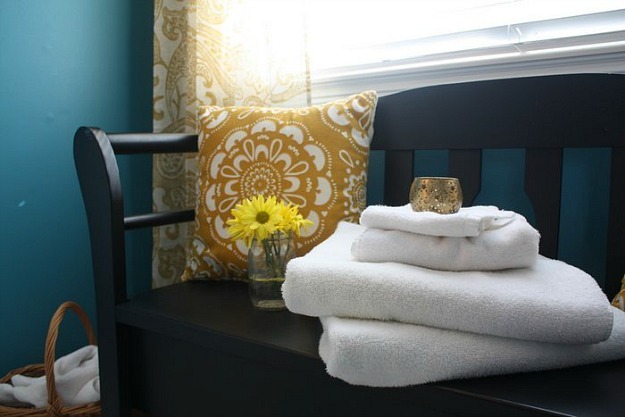 I love the color of the walls and the bench looks so much more “expensive” painted black, thanks for sharing. You two did a great job!!!!! It looks awesome! I love the wall color and the curtains pull it all together. Great job and fix for the black grout. love it. It’s gorgeous! I love the tile and the wall color is so pretty! Happy New Year!! That looks great! I think the black grout ended up turning out really well. Beautiful bath Julia! Love your curtains, they are so pretty in that space! You truly did an outstanding job! I would love to wake up to that bathroom every day! I love the color and the tile came out beautifully. Gorgeous! I just adore that tile. Love it! I also love that the builder seemed to give you some flexibility with the floor plan. Our subdivisions in our area don’t for things like moving a laundry room! I have always said that if we are ever able to build a custom home, the laundry room will be off my master closet (and on the bedroom side of the house), NOT next to the kitchen or worse, in a small hall between the garage and the kitchen. Why do builders still do that? I have paid extra in our last two homes to have a door framed between the master bed and bath, but a mudroom would be a dream, even in the hot southwest where we don’t have snow gear. I would love a “drop zone” for backpacks, shoes, sports gear, brief cases, etc… I think your swap-out is brilliant and the room is gorgeous! Glad the tile trim worked! Crisp and clean. Amazing how just a little molding can make such a difference. I must say that I love the window area with the bench and curtains. In fact, I love your whole house. I couldn’t find a tour of the kitchen, is there one? Also, I do not like the lights above the sink at all, maybe different ones? (When money allows, of course). I love the rest and how you added the washer and dryer to the bathroom, near the closet! My sink cabinet, double but with only one sink, is actually at one end of the bedroom with the shower and toilet in a small room off it. It started in the 70s, this idea of the sink in the bedroom. My bedroom was painted Quietude by Sherwin Williams two years ago. I fear I am tiring of it already. Oh, it’s lovely! It turned out so bright, neat and clean. I love it! all that work was worth it!!! looks amazing girl:) we need to frame out all our mirrors too…ugh! Very nice, Julia. 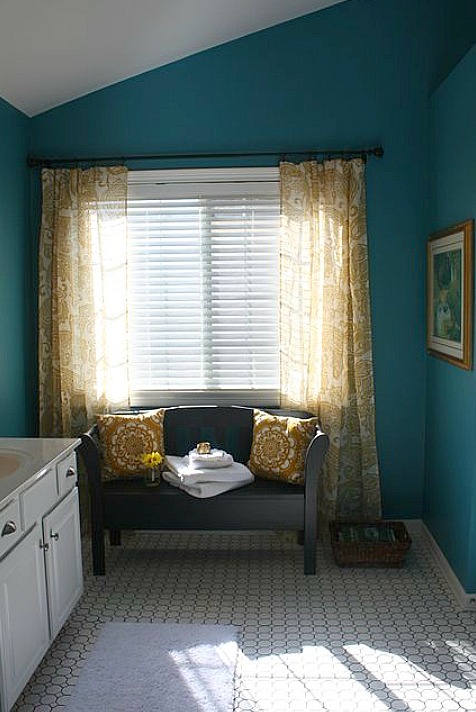 I love the color, the tile, the fabric choices… Bravo!!! That turned out really nice and you threw elbow grease into it. 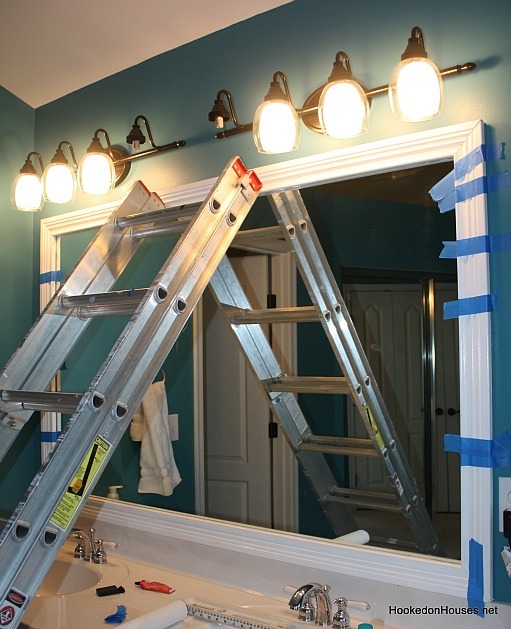 I was worried when you said you were gluing molding to the mirror but it looks pretty sturdy/stable? Yes? Please???! 🙂 Okay, I am going to start planning a kitchen remodel this year… working out all the details, shopping for the details, saving my little pennies. Hope to kick it off in 2014. How is that for long term dreaming? Your kitchen posts were so well timed. Thanks for that! You were so right about the grout and how it turned out. I would have freaked too when noticing the black. Perfect idea! We had a mirror in our dining room like that. Aren’t contractors wonderful? I would not touch it. They somehow got it down, without breaking the mirror. Bathrooms are on the horizon for me too. Two, I’m hoping. They are in dire need to gutting. It’s really sad to see them as they are right now. I cannot wait. Gorgeous bathroom! I love how the simplest changes made such a big difference. Everything looks fantastic especially the tile. 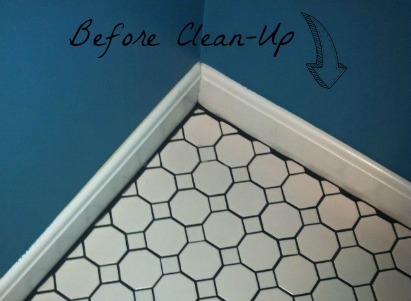 Your bathroom looks so much better without that carpet. I have never liked carpet in a bathroom. It gets dirty easily and it’s hard to clean. I think I heard the same angels singing! 🙂 It looks great! Love the blue and gold together! LOVE!! Everything looks great – esp that floor!! Really… you did grate darling! Looks beautiful Julia! Not a difficult fix and it really looks so much cleaner and finished now. I love your colors and the PB drapes. 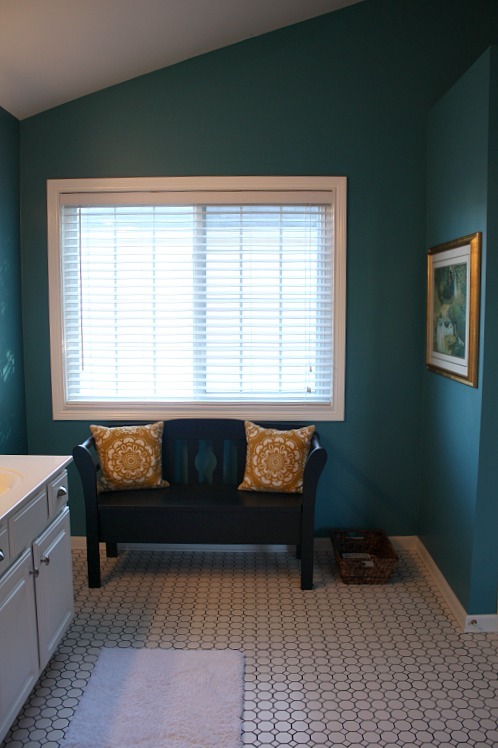 We recently painted our master bathroom in Sherwin-Wiliams “Sea Salt” and I just love this color. We have only one big house project planned for this year….. A new roof! Yeah, sounds boring (and expensive). It’s beautiful! I love the blue and the black on the bench really makes it pop. Great job. Yay! After all the tile stress, it turned out fabulous! 🙂 Love the bench painted black and the linens add a touch of the exotic. Very, very nice! You must be so pleased! Wow Julia, I just love the way everything turned out for you in the Bedroom and Bathroom.I love the colors on the wall.The builders here have done the same thing with having no doors between the bedroom and bathrooms,I really don’t like how they look.I’ve been wanting to do the same on the mirror,we have the same BIG mirror at our vanity,I love the way it looks when it is framed up. The 2 rooms look soo good together.Great job Julia.I’m looking forward to your next project. My one and only decorating goal is to get my living room curtains up. I’ve had them for months, but cannot find a 13 foot pole!!!!! Of course two 6 1/2 ‘ poles with a center connector would work, if I could find that, but so far, no luck. Dare to dream, right? Hi, Mary. I couldn’t help but notice your comment. I have a 10 1/2 foot pole across my window. At Home Depot they cut a long pole any length for you, then you can paint or stain it. Mine’s been white, gold , now it’s sprayed oil rubbed bronze with pineapple finials. You may need a center support. It’s pretty cheap, too. Our daughter is getting married on February 2, and then we will begin our total kitchen makeover! I love it, Julia! Our entire house was “camel” when we bought it and we are slowly painting rooms. Tooooo much camel is NOT a good thing. We also have the no door issue here and it’s my biggest pet peeve in this house! My ten your old boys have walked in one to many times and my husband has startled me way too many times to count while I’m showering! I HATE it! I’ve begged for a door for 5 years now and it hasn’t happened. 🙁 so….I am going to make our master bedroom paint and a door to the shower area our goal for 2013. I’d love a hanging antique barn door! I did a google search of “master bedroom bathroom no door”. And found that this IS, in fact new trend that most women hate…. It’s funny to read, but now I’m in a VERY bad mood! Beautiful re-do Julia! You’ve got great taste. Love the tile. It looks great! I actually like the big mirrors…and we did the same thing, however instead of mitering the corners we used square “rosettes” so we didn’t have to worry about all the angle cuts, which for us was a nightmare! I do agree tho that gluing the trim to the mirror is difficult, even with Liquid Nails! Beautifully done Julia. I am usually not a fan of newer homes, but when they get customized with personality like you have done and turn out great I am reconsidering. Thanks for sharing, Julia! I love the way your master bath turned out. When I first clicked onto your blog I thought the bench shot was from a magazine shoot or something! 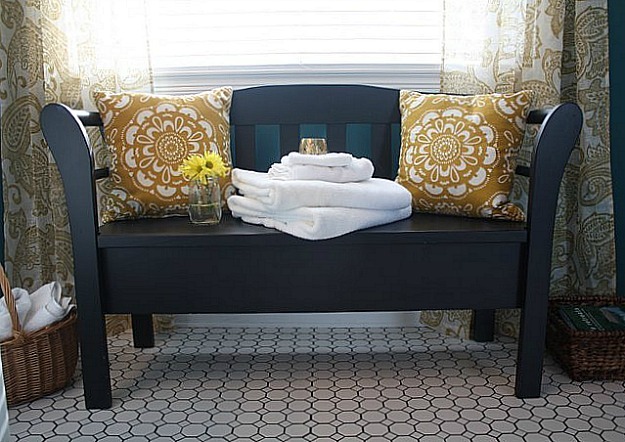 I love the bench black and the pillow fabric. Also, Dave gets a big hug for his molding efforts.Great job! I have many dream projects for 2013, but we are putting our second son through college, God willing. One down , two to go. Six more years. Save now, people.. I do satisfy my urges with small, creative seasonal changes here and there. A bunch of tulips goes a long way . Happy New Year!! Absolutely stunning revisioning, Julia, and with such small, (mostly) simple changes, too! Respect. So much of what you created was simply about the trim. 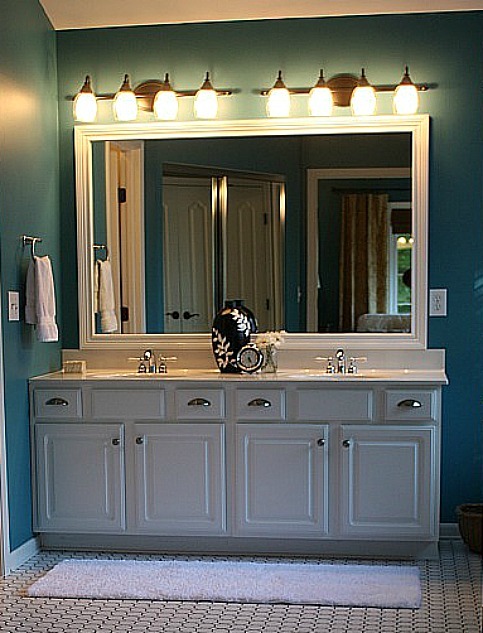 The floor trim and the mirrror trim transformed it. That gives me ideas. Beautiful color on the walls too. Gorgeous transformation Julia!! !…just love the colors! Love all of this, especially the teal/yellow combo. And that navy bench!! I bet you’re enjoying the heck out of your new room! You did a great job on the bathroom! Regarding the tile, I’m surprised the tile guy didn’t take the baseboard off before installing it. That’s what the person who did our bathroom floor did and then re-installed the baseboard after the new tile went in. Great solution with the quarter round and all of the other trim. It really makes the bathroom! Julia, it turned out beautifully! Love it and love that you have a bench in your bath. Perfect place to dry off and put on your slippers. 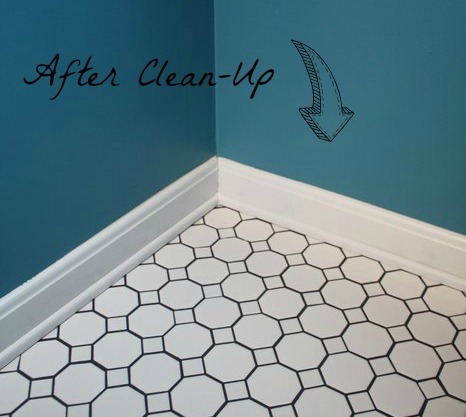 The trim really looks great with your baseboard and tile. 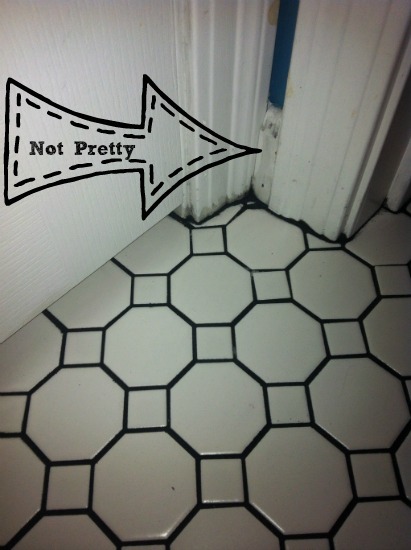 So glad there was an easy fix for the grout problem you were having. Love your new bath! OM Goodness! I saw the tile FAIL before I saw the fix. I was all paranoid because I had recently settled on this exact tile with black/dark gray grout for our bath and when I saw the blunder around the edges I had a minor heart attack followed by sadness. I can’t tell you how excited I was to see the finished product! It looks beautiful! What a good quick thinking hubby you have. LOVE it! all that is warranted IMO. I dont know how you stood carpet for 8yrs. Id be fearful it were full of feces and urine . wait, so you moved the laundry upstairs to your master, how big is that closet? plus in the other pic you put the bathub in the toiler room/water closet..what are your bathroom measurement bc it looks HUGE…and you have a bench to sit down on! bedroom? I WANT YOUR BATHROOM. is there hallway access or kids would have walk through your bedroom to washer/dryer ? Well, to clarify, the carpet was just in the vanity area with the sinks. That’s actually a common setup for master baths in houses in our area. 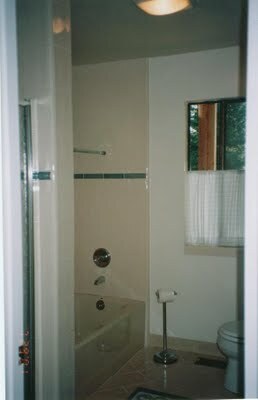 Every newer house we looked at had an open room with sinks (no door from the bedroom to the bath) and then a separate toilet/shower room with tile or vinyl flooring. Even model homes. Pretty much all the houses in our neighborhood were built that way. I’m sure it saves the builders $$. I just talked to my neighbor who still has the carpet in her vanity area and says she won’t ever change it, but I was thrilled to get rid of it in mine. The kids do have to walk through the bedroom to get to our bath (and laundry). The washer/dryer are just in a closet behind those doors. Not very big. But so much better than lugging the baskets all the way downstairs and through the family room, kitchen, back hall, to the mud room. Hey! Great remodel! I know this is a very late post but I had to comment. 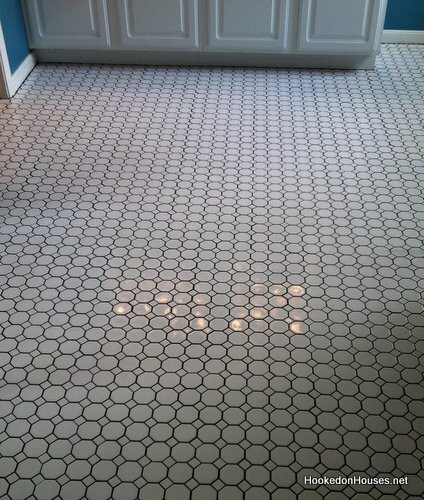 I have the same exact tiles in my master bath and did a white grout— big mistake! It is impossible to clean perfectly. We are selling the house and I’ve been on my hands and knees for hours with one of those bleach pens lol. Black grout is a GREAT idea! I used white grout in the guest bath and it’s already getting stained. You’re so right! Urgh. I’ll have to give the bleach pen a try! I got the rugs from Target. I made the mistake of using white grout in the kids’ bath and it’s already giving me grief. Ugh is right! I’m so relieved you got the black grout problem fixed! I missed this post and have actually thought about your bathroom off and on since you had it tiled and wondered if you got it resolved. We have had a few remodeling projects that haven’t gone well, so I am dreading redoing our kitchen that is very dated from the early 90s. It was a home show house (we bought it 3 years ago) and has bright teal, speckled Corian with a white racing stripe. The whole kitchen needs a re-do because it is very inefficient but I honestly don’t think I have it in me. I may just opt for a new countertop and call it good for about 5 years. I’m in love with your bathroom re-do! Magazine worthy! While personally I am a little leary of bathroom tile floors for myself, I love the look of yours. I use to have a pair of glasses that one lens didn’t stay in well, and would fall out occasionally. Always landed safely and I would pop it back in. Then one day I was in a tiled bathroom, I looked down and the bugger fell out. Like in slow motion, I saw it fall, getting smaller, til it connected with the floor. Smash! BUT your floor is so gorgeous, I’m going to have get over that long ago issue, and re-think a tile floor. The black vs. white grout was a smart move. The installer should of raised the issue of possibly removing the molding and re-installing over the tile. My thought would’ve been to paint white around the edges to make it less noticeable. But your hubby’s fix was perfect. While I love the look of the natural wood bench, the black is so right! Excellent idea. I think I’ve just been inspired enough to tackle my 50’s bathroom. Gray plastic tiles lower half, and pink painted upper half. Yeah, depressing. But it could’ve been worse. At least the fixtures are white and not pink like some I’ve seen from that era! Wayyyy late to the party…but I wanted to say, it came out great! The curtains made a huge difference, too! WHY did people think it was a good idea to make master bedrooms and bathrooms open to each other??! (Even if it IS just the sink area.) I don’t like that at all. Great job covering up the grout on the edges. That did the trick!